While commenting back on some comments left on my blog this last week, I came across The Fresh Batch Sketch Blog. I love sketches, because a portion of my design work is already done for me, I just need to find the right stamps and card stock to work with the given sketch as inspiration. I used the current sketch - sketch 11 from the Fresh Batch Blog as inspiration for my card. All images are from Kitchen Sink Stamps. As with my red rubber stamps, I like to condition my clear images to get nice crisp images when stamping, to do this I gently rub the end of a pencil eraser across the stamps, then wipe off any remaining eraser shavings, ink and stamp on scratch paper. I used my SAMJ to stamp Cherish from the Vintage Words using Momento Black Ink. I used the Circle Nestabilities and the Out of the Box Technique to cut around the Hibiscus. 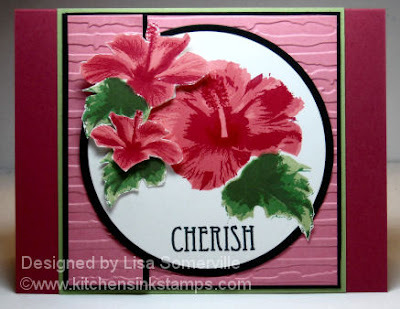 The smaller Hibiscus were stamped and popped up on dimensionals. Ohhhhhhh, to die for beautious! Just luv the new stamps and Congrats! for being part of the Kitchen Sinks Crew! Amazing card..
Beautiful card! I love the layout and colors! Beautiful Lisa! My fav color and my fav flower...great card for a pick me up w/ the weather we have today. Stunning, Lisa! Love how you cut a few of the flowers out and popped them up!! lisa...this is absolutely stunning! beautiful colors and dimension! amazing job! thanks for playing along with this week's sas sketch, and i hope to see you again next week! Bright and adorable! Love it! ooooooh, Lisa! So pretty! the black makes it really stand out!